Yesterday I was reading about ancient civilization of Indus by Researchers and Professors from various universities around the world, as they describe it “ Mysterious” . But my personal experience differs, I have visited Mohenjo Dero, ( Indus Valley ) I noticed many things which weren’t either pointed by them or noticed. 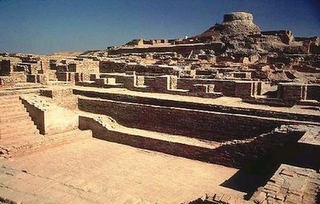 By the way The name Mohenjo–Daro means “Mound of the Dead.” In sindhi language. The City architectural designed is not usual, very civilized way, they mentioned that there was no one governing the city and their profession was farming, indeed at the point of profession I can agree with them thus, when it comes on governing the civilization Mohenjo Dero ( Near by 20 KM away Larkana , Sindh , Pakistan ) in present days, one of the ancient civilization approximately 5000 BC. I noticed a lot of things there, I would like to point out the major aspects which I didn’t get to read or visually see in NET GEOGRAPHY Channel’s Documentary. * Language of Harppa and Mohenjo dero differ “ cannot be read the ancient text which is found embossed on the stones, all thou both civiliazations were at most same times away from each other nearly around 700 miles north west of Mohenjo Dero. * Change of river Indus course, is not something even in modern technology can do, canal, channels are possible but turning the entire river from 30 KM away making a diversion of at least 60 to 80 KM to make it cross from Mohenjo Dero for farming and windy weather. * If the people were tall as they can be seen in museum and history tells us, why the room size is small 8×10 feet to 10 x 12 even smaller room are there. * Entire city drainage system was inter linked with Big Bath, on the mount nearly 50 to 60 feet above city a pond where the storage of the water used to be, and without using any modern technology, uplifting the water from the Indus River into it and draining it in to the city for drinking, and cleaning the streets, remarkable which does not require any technology like present days, it was purely reverse engineering which is very new to modern science. To force the water 50 / 60 feet up there are no gadgets but path route technology is beyond my expectations that they were able to do all this without using man power and from Big Bath, draining the water for the purposes as mentioned before without single person’s command, basically the weight of the water was the force means “ Gravity was not something new to them”. * I saw jewellary but no sign of women apart from big Pool in the center of the city, toys , metal gadgets, pots and unbelievable “ Ajrak “ prints are there. People those who live in nearby villages I had interaction them and I was told that Quakes were the reasons which destroyed the Empire of this civiliazation, the traces can be seen undoubtly and Mohenjo dero is half upside down and it hasn’t been mentioned in history anything regarding earth quakes. What was the major role of females ? Was it like an Egypt as it was in it’s final terms, ruled and governed by women not men. * From no where it seems that this City of Mohenjo dero was built time after time, like modern cities it is like all at one time, who could plan so well, as the planning of the city is? Why such information is being kept secret hidden from today’s global culture. * 5000 BC, I think we are talking about stone age almost, in that period of time intelligence and such architectural design wasn’t just Mohenjo Dero or Harappa but Indus Civilization was broad and wide from North East to South West Radius ( in present days ) entirely it is in Pakistan. But what were the real names of these cities? if languages cannot be interpreted least one is not blind to see the signs and symbols animals and half moon which represents life. Metal was not used for construction purpose but for basic required needs, almost 99 percent entire of Indus civilization is based on Stone structure. Still the mount , big bath , pool , streets , drainage system , is way better than any 100 year old construction. Why there is no sign of burying , discrimination or anyone has not mentioned about where did they went. Do they call this a mystery, My personal comment on this I don’t think so. If anyone says Egypt was more civilized than Indus Valley, he better think twice, If they can nail the river Nile. Indus Valley people changed Indus river, there are so many things which are common in between both. Hence if one has visited Egypt and not Moen Jo Daro, better visit and see, expedition is on going in near by areas even now and archaeologists have discovered traces of other cities near sukkur which they say are even older than Moen Jo Daro. It is my advise to all who are interested in such thing to visit and not only see but understand what made Indus Valley civilization The Unsolved Mystery. Kindly leave your comments and suggestions, I appreciate it, thanks for reading, hope you will follow my blog and keep experiencing my way.